3503-10 chef hotplate element plug in small 5 1/2" (145mm). Element has bent wires.1100w. This is the small element. (3 of the 4 elements are this size). 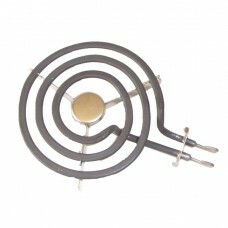 This fits a Chef cooktop manufactured from about 2000 onwards that have 5 1/2 (140mm) and 7" (175mm) elements. Earlier model Chef Stoves had 6 1/4" (160mm) and 8" (200mm) elements, that looked the same, so please measure the element t make sure its the correct one for your stove.